The canalside public space surrounded by Aylesbury Waterside Theatre, Travelodge, University Campus Aylesbury Vale, Waitrose and the town centre’s canal basin. Aylesbury’s first canal festival burst into life with an abundance of colour and entertainment on Saturday. 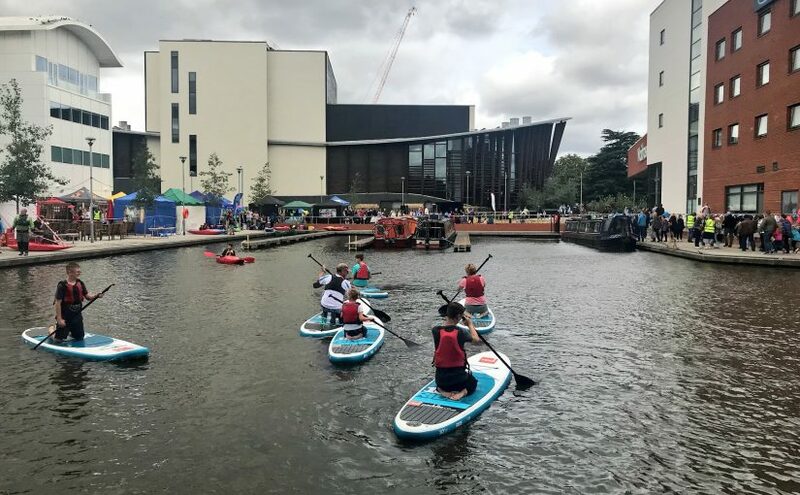 Visitors flowed to the town centre’s Waterside area to celebrate the past, present and future of this beautiful canalside public space as it starts a new chapter in its two hundred year history. Situated in one of Aylesbury’s most picturesque settings, surrounded by Aylesbury Waterside Theatre, University Campus Aylesbury Vale, Waitrose and Travelodge, the Waterside area provided the festival with a great backdrop to this eagerly anticipated community event. Organised by Aylesbury Town Centre Partnership and working in partnership with local businesses, organisations and the councils, this new event was the result of months of hard work with the aim to introduce visitors to a little-known part of Aylesbury. Combining a winning formula of both water and land-based activities, festival goers were delighted with the vast choice of events and activities on offer, including free taster sessions for canoeing, paddle boarding, kayaking and fishing from the Canal & River Trust (in conjunction with Chiltern Canoe Club and Tring Anglers), as well as canal trips with The Little Trip Boat. “The paddle boarding was AMAZING! We all really enjoyed it,” said George, Charlie and Henry, students from Long Crendon School and Lord Williams’s School. For those who preferred to stay on land, an amazing selection of stalls were available to browse, including a continental market provided by Geraud market and a floating market courtesy of Roving Canal Traders Association, as well as historical heritage walks, theatre tours, BuDS chill-out zone and UCAV tours. Stage theatre performances from Russell Scott’s Next Stage Choir, Alarum Theatre, Ubiquitous Theatre and Jacob Cole also enhanced this fabulous festival experience. “It’s been a fantastic day trading to the landlubbers who will now be spicing up their grub! I’d certainly be keen to come back should the festival return for 2019,” said Bunny, owner of The Herb Boat. Previous Previous post: Waterside Festival – just two days to go!